Sweet potato casserole is one of the best recipes that my Grandma had in her recipe card arsenal. Nothing is better than her easy sweet potato casserole with marshmallows to warm your soul on a cold winter’s day. My Grandma’s sweet potato casserole recipe is something that I absolutely love making. As far as casseroles go, this is one that the entire family is going to go crazy for. If you’re looking for other casseroles to keep the family warm and satisfied, you could try this veggie-packed Green Bean Casserole recipe, corn pudding or these scalloped potatoes. Whenever we visited my Grandma for a holiday, she would spend so much time in the kitchen cooking from scratch. As a girl, I loved nothing more than being in the kitchen with her, helping to make all the homemade treats. I fondly remember making this sweet potato casserole recipe with her. When I was very little, I would help with simple things like adding all the ingredients into the dish. Now, I do the same with my children. They love helping me make this classic casserole. 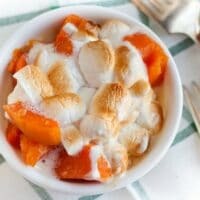 One of the things I love the most about my Grandma’s easy sweet potato casserole recipe with marshmallows is all the fresh and delicious ingredients. Whenever she could, she would try to get her sweet potatoes fresh from a market so she knew they were the best of the best. When it came to the quality of food, she never compromised. The thing that makes this one of my top rated casseroles is the topping. 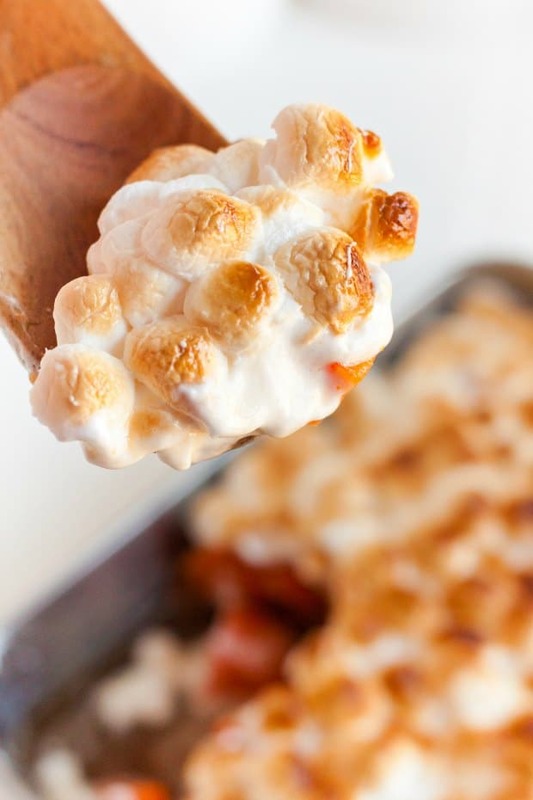 It wouldn’t be an amazing sweet potato casserole without the baked marshmallow topping. Some people in my family like to stick to the original white marshmallows on top of their sweet potato casserole. If you want to make your casserole slightly less traditional, my Grandma would sprinkle the top of her sweet potato casserole recipe with nuts like pecans. This sweet potato casserole recipe might be old fashioned, but I think that’s what makes it the best. It’s not overly complicated. It uses a few simple, fresh ingredients which are the heart of this amazing casserole. You can’t expect to cook a top rated sweet potato casserole without using the best ingredients. You can really taste the difference when you use fresh yams in this recipe. 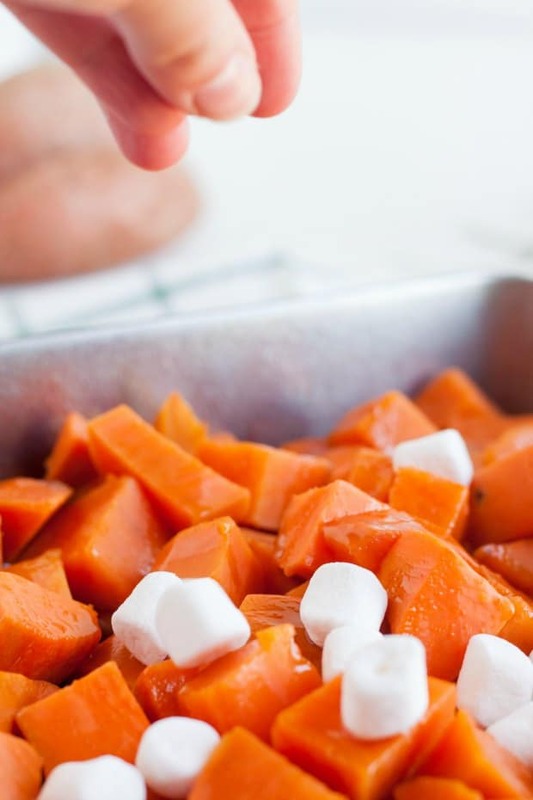 Making this sweet potato casserole with marshmallows couldn’t be easier. With few ingredients and only a handful of steps to follow you’ll be tucking into sweet potato goodness before you know it. Out of all the baked dishes that my Grandma makes, this has to be my all-time favorite. Good homemade sweet potato casserole begins with the sweet potatoes of course. You need to make sure that they’re cooked just right. Skin them, then cut into one inch chunks. Boil in a pan of water until soft. To create your syrup, boil water, brown sugar and butter until reduced. It will be the consistency of maple syrup. Once the sweet potatoes are fully cooked, layer them in the bottom of a casserole dish. Pour the syrup over them and top with mini marshmallows. Bake at 350* for about 30 minutes. You’ll want to watch closely to make sure the marshmallows don’t burn. You just want them toasted, like in s’mores. And they can burn fast at the end, so be diligent. A holiday wouldn’t be a holiday without the smell of fresh sweet potatoes baking in the oven. 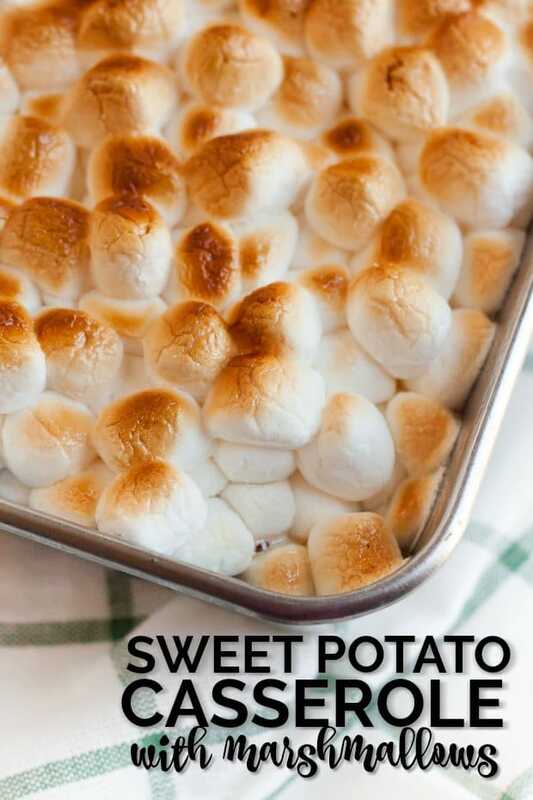 Sweet potato casserole with marshmallows makes for the perfect Thanksgiving dish, but that doesn’t stop us from enjoying this classic casserole all year round – we love it at Easter as well. Nothing beats an old fashioned sweet potato casserole to fill everyone’s bellies and leave clean plates. Sometimes, simple dishes like this one are the best crowd pleasers. 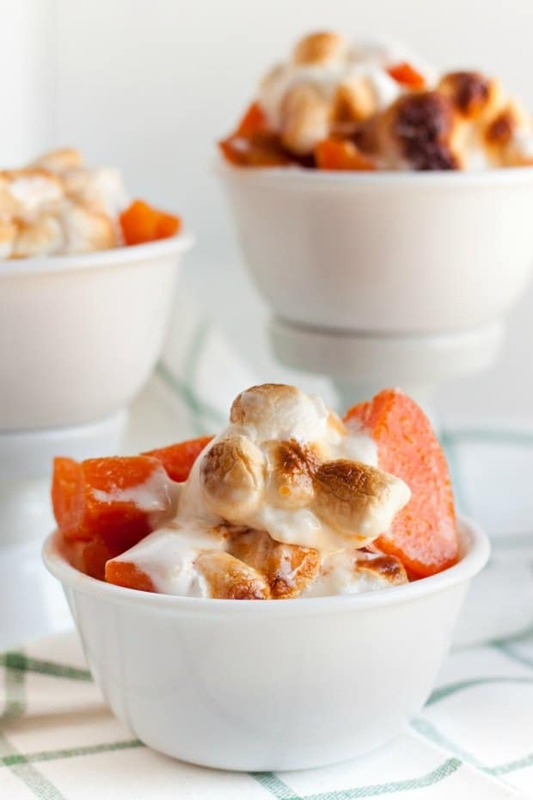 Nothing is better than her award-winning sweet potato casserole with marshmallows. Skin the sweet potatoes and then cut into one-inch chunks. Boil in a pan of water until soft. Bake at 350* for about 30 minutes. You'll want to watch closely to make sure the marshmallows don't burn. You just want them toasted, like in s'mores. And they can burn fast at the end, so be diligent!